THE BLEACHER BRIEFINGS: College Bowl Season is Finally Here! 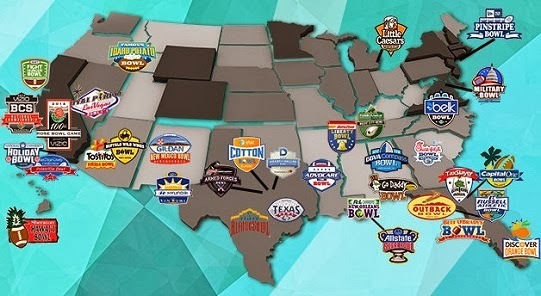 College Bowl Season is Finally Here! Is it just me, or has it seemed like an eternity since we last saw a college football game? Okay, so "eternity" may be overstating it, but needless to say, I'm glad bowl season is finally here. This Saturday, teams will take the field in the first of 35 total bowl games to be played, assuming you count the BCS National Championship as a bowl game. Initially, I thought about giving you all 35 picks in this article, but since I plan on going into a little bit of depth on why I think each team will win, that would've taken forever and a day to read, so I'm just going to do a week at a time (assuming the web master let's me keep doing it), until we exhaust all games. The first bowl may go a long way towards the argument that there are too many bowl games/too many bowl teams. This probably won't go down as anyone's favorite game, considering that both squads barely have .500 records on the year, but we are going to analyze every game, so here we go. Washington State limps in losing four of its last six, but the two wins were pretty quality ones, at Arizona and at home versus Utah. Throw in a win early in the year at USC, and a narrow 7-point loss to eventual national title game participant Auburn at Jordan-Hare Stadium, and there is definitely something for the Cougars to build on. They are also coached by one of the wackiest and least predictable coaches in college football, Mike Leach, so anything can happen. Colorado State was just the opposite of the Cougars, winning five of its final seven contests, so they had the hotter hand down the stretch. The Rams also boast one of the most balanced offenses in the nation, the only team with a 3,000-yard passer (Garrett Grayson with 3,327 yards) and a 1,500-yard rusher (Kapri Bibbs with 1,572 and a nation-leading 28 rushing TDs). Washington State is a one-dimensional offense if there ever was one, led by quarterback Connor Halliday, the fourth-leading passer in the country with 4,187 yards. They were in the bottom three teams in the FBS this year in rushing. Expect Colorado's balance to win out, but in a shootout; Rams 52, Cougars 45. I can give you several reasons why both of these teams could win this game, and just as many why each could lose it. USC, highly ranked at the beginning of the year, overcame a shaky 3-2 start and the firing of then-coach Lane Kiffin to rally behind interim coach Ed Orgeron, a player-favorite. They finished the season 9-4, but lost the final week to cross-town rival UCLA, and since have named their new coach, former assistant Steve Sarkisian, whom they hired from Washington. Orgeron promptly resigned to pursue another head coaching job, leaving the Trojans with their third coach of the season in offensive coordinator Clay Helton (Sarkisian is staying at Washington through their bowl game). Fresno State is coming off their best season in team history. They finished the year 11-1, and won the Mountain West Conference. These should all be positives, but Fresno was poised to be a BCS-buster and get into their first BCS bowl game until the next-to-the-last game of the season, when San Jose State rained on their parade. The Bulldogs do boast the best passing offense, statistically, in the country, led by QB Derek Carr. They are also third in total offense and fifth in scoring, so the USC defense better be prepared to play. Usually, the team who was expecting one bowl game (Fresno) and winds up in another, doesn't do very well. But this time, I think the chaos on the coaching carousel will be too much for USC to overcome. I like Fresno to win (even though they've lost their last four bowl appearances), 42-38. Buffalo may have had the toughest first two games of any team in the country, going to Ohio State the last day of August, then to Waco to play Baylor in Week 2. They lost both of those games, although they put up a good fight against Ohio State. The Bulls then ran off seven wins in a row before dropping two of their last three games. They are led by two-time 1,000+ yard rusher, Branden Oliver, who finished with 1,421 yards and 15 TDs. San Diego State had an even rougher start, going 0-3, before closing with seven wins over their last nine. In the final two games, however, their star back, Adam Muema, who has also rushed for more than 1,000 yards each of the last two seasons, sputtered to only 57 yards combined on 36 carries. Unlike the other games so far, I don't think this will be a shootout, as both teams look to run first. Considering the success of MAC teams in recent years during bowl season, I'll take Buffalo, 31-21. Two in-state teams squaring off in New Orleans will mean a good gate at the game, but maybe not so much on Bourbon Street, which the locals are usually smart enough to stay away from. Those that attend this one might have more fun down in the tourist trap. There's no easy way to say this; Tulane's offense is bad, period. They rank 104th in total passing yards, 102nd in rushing yards and 89th in scoring. Lucky for them, they are 19th in scoring defense, so they can usually stay close. They lost three of their last four games, though, so it wasn't exactly like the Green Wave came rushing in with a lot of force. It was more like a drippy faucet. LA-Lafayette, on the other hand, are a lot of offense without many means of stopping their opponents, ranking 68th in scoring defense. When the Ragin' Cajuns have the ball, it will be strength-on-strength facing that stingy Tulane defense. When the Green Wave has it, the game may look more like the Keystone Cops versus the Three Stooges. I think the Cajuns (the ones from Lafayette) take this easily, 35-17. On paper, this looks like one of the most one-sided affairs of the whole bowl season. It won't look much better on the field, either. Ohio comes in losing three of its last four by a combined score of 123-16. They did manage to retain a little bit of dignity by winning their last game against UMass, but hey, it was UMass, so I'm not sure how much dignity that allotted. The Bobcats don't particularly run the ball well. They don't particularly pass the ball well. For that matter, they don't particularly defend the goal line well, either. The only hope is that the Pirates are still bummed that they didn't win Conference USA, which most expected them to do. They were upset in the final regular season game by Marshall, which catapulted the Thundering Herd into the conference championship game. ECU is led by Conference USA MVP Shane Carden, who was sixth in the country is passing with 3,866 yards, eighth in TD passes with 32, and first in the nation in completion percentage at 70%. Expect this one to be over at halftime, with the final somewhere in the neighborhood of ECU winning 52-21. Boise is a shell of its former self, a squad that for several years was the BCS pundits biggest nightmare. They can still score, ranking 17th in the country, but nothing like those teams of a few years ago that went down to Athens and shocked Georgia. All that success led to Bronco coach Chris Petersen being wooed away by Washington, so this will be the first of Boise's twelve-straight bowl games where Petersen won't be on the sideline. Normally, I would pick against anyone losing their coach between the end of the year and the bowl game, but then I see Boise's opponent and how poorly they finished the season, and I don't really think it will matter who is on the sideline for the Broncos. Oregon State followed a disappointing opening-game loss to Eastern Washington by running off six-straight wins. You can see by their record, that was the only wins of their season. They lost their final five games and were barely bowl eligible. Oregon State will sling it around the yard, as they are the third-best passing team in the country, but being 118th in rushing, and 96th in scoring defense does not bode well for the Beavers. I don't see that defense being able to dam up Boise's potent offense, and I believe the Broncos win easily, 45-31. Pitt has impressive wins this season over teams like ACC runner-up Duke, Notre Dame, and Syracuse on their resume. Unfortunately, it also has losses to Navy, Georgia Tech and North Carolina. So it may just be a matter of which Panthers team shows up, the one with claws out and teeth bared, or the one that just wants to sit and lick itself. Actually, scratch that. At 61st in passing, 112th in rushing, 86th in scoring and 71st in scoring D, there's little hope against a much better Bowling Green team. The Falcons are in the top 35 in the country in all those categories I just listed, and in scoring defense, they are in the top 5. They ended their regular season by beating No. 14 Northern Illinois and Heisman Trophy finalist Jordan Lynch. Bowling Green does have the dreaded replacement coach at the helm, as the man who led them all year, Dave Clawson, was hired by Wake Forest. Interim Adam Scheier will man the sideline for this game. I don't think that will be enough to deter Bowling Green, as I have them winning, 35-24. Utah State comes in hot, winning five of its last six games, and boasts a stingy defense ranked 7th in scoring. They lost a heartbreaker in the final game by a touchdown to No. 24 Fresno State, or they would've closed out with six-straight wins. The defense will have the daunting task of stopping Jordan Lynch, who is one of the most physically punishing runners at any position, much less as a quarterback, in the country. Lynch needs only 119 yards in this game to become the first player in NCAA history to both rush and pass for 2,000 yards in the same season. Let that sink in for a minute. A quarterback who may rush for 2,000 yards in a season, while also throwing for more than 2,000. That's just freaky. The biggest drawback for the Huskies is that they were one win away from playing in their second-consecutive BCS bowl before losing in the final regular season game to Bowling Green. Not sure a program like Northern Illinois will be able to put that kind of disappointment behind them. I'm picking the upset here. Lynch gets his 119 yards, but doesn't get the win. Utah State, 24-21. That's it for this week. I'll be back next Friday to pick all the New Year's Eve and New Year's Day games. I don't think Northern Illinois will lose, but aside from that, I like your picks. Good read.